27 September 2018, Wolverhampton, UK ~ Wolverhampton on Saturday night, 22 September 2018, saw a huge local Black Country crowd turn-up for a well-supported nine race card and ARO was there. 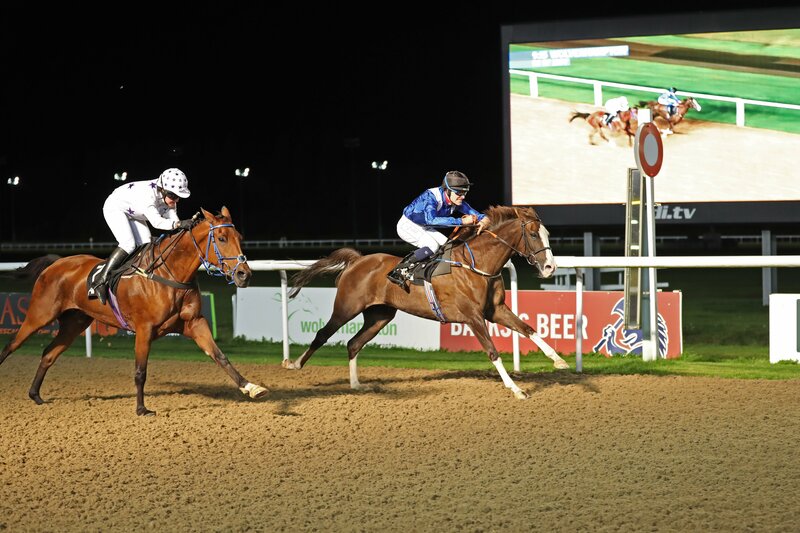 The Arabian Racing Organisation Amateur Riders Handicap Stakes for horses rated up to 110 attracted a field of nine runners going to post for the one mile and six furlong event. Several inform horses including recent Chelmsford winner Saleemah and the improving Hau Kola were placed on the same card. Others dropping down from Group PA company included top weight Ishfaq representing the recently crowned 2018 champion trainer Phil Collington, previous Group 2PA winner Kao Kat MHF and Zayin Angkor Centurion, stepping up in trip and trying to recapture his early season form when second in the Royal Cavalry of Oman ARO Cup Gr3PA. Many of the nine strong field were trying this trip for the first time, Aljawaaher racing from 18lbs out of the handicap set steady early fractions under Mike Palmer. Closely followed by Rafeef, Joanna Mason and Will Pettis on one of the few guaranteed stayers Saleemah (Madjani x Laqataat). A tightly bunched field raced past the stands rammed full of Wolverhampton Wanders supporters still delirious from their teams 1-1 draw with Man U earlier on Saturday. Zayin Angkor Centurion was pulling noticeably hard. Turning down the back straight Mike Palmer had the field stacked up, virtually none had changed position, every horse still traveling on the bridle, jockeys beginning to look for racing room. Antonia Peck eased best turned out winner Al Faaris around the outside of the leader Aljawaaher and the pace started to lift, the race was on. There was just enough room on the inner for a medium horse and luckily that is what Saleemah is and Will Pettis had enough horse under him to take full advantage leaving the back straight. Most of the chasing pack was by now off the bridle and in full flight, nothing traveling better than the leader. Hau Kola was creeping stealth like into the race under Serena Brotherton. He passed one, then another, just being nudged into contention saving every last bit of energy for one final assault up the home straight. Leaving the home bend behind them Will Pettis had kicked into a four length lead, a look around at the pursuing pack he must have liked what he saw until he caught sight of the emerging figure of another Madjani colt, Hau Kola. He sent Saleemah for home and she gave generously, responding to his every urge. Hau Kola was also in full flight, he too keen for a fight and he stuck his head down and galloped, inching closer with every lung bursting stride, getting there, getting there but Saleemah had done enough and held on for an unequalled third win in 2018. Hau Kola deserves plenty of credit for making a horse race, Ishfaq had been caught out when the pace quickened, but ran with credit finishing third under top weight and James Owen’s pair Rafeef and Al Faaris finished fourth and fifth respectively both horses have had good seasons winning three times between them. For winning jockey Will Pettis it meant he pulled another one back in the jockey’s championship, drawing level with Charlie Price on 9 winners each, 7 seconds a piece the count back goes down to third places, with Charlie just edging it by 9 to Will’s 6. ARO are next back at Wolverhampton on 6th October for the final race of the 2018 season and on this occasion they will be supported by Madness tribute band, One Step Behind.